Don't forget to keep an eye on the Term Calender on the Events page! Click on the link above to check out our latest Newsletter! It's offical on Wednesday 15th August all Primary school NZEI Principal's & Teacher's will strike in protest of the ongoing & unaddressed issues plaguing our teaching profession. The ongoing impact of which could significantly alter the educational environment and place future generations of students and teachers in a compromised position, through no fault of their own. Below is a link to the Parent Info information shared at a recent presentation. Our new junior sports tees and senior basketball/touch singlets have finally arrived! A huge thank you to Number One Electrical Solutions and Brownmore Construction for their kind donation towards the cost. Our little athletes are going to look deadly out on the sports fields!!! Waimata School rocking their performance at the 2018 Beach Hop Warm Up Party in Waihi. 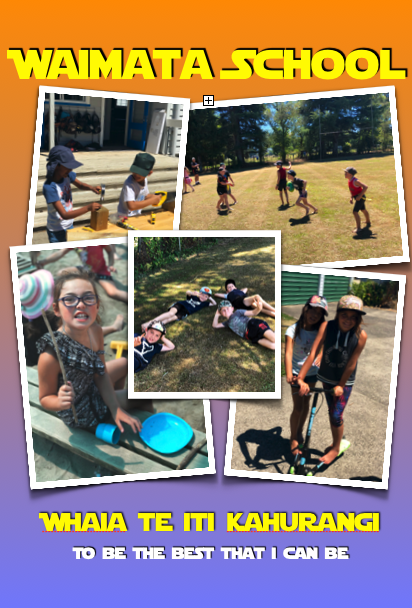 It was our absolute pleasure to welcome Dennis Katsanos & Courtney Tairi from Sky Sports to Waimata School to shot a special segment for their 'After Match' show on Sky Sports NZ! For those of you that missed out check out our awesome little TV stars below! Ka mau te wehi!!! Check out students from our kura representing Te Roopu Kapa Haka o Te Hononga o Waihi at the recent Matariki Waihi Community Concert. Mauri ora whanau! As the saying goes better late than never! Tumeke day with some pretty mean tamariki. We are proud to announce that we have placed 2nd earning ourselves a fantastic prize of $5000 worth of HP technology! Ka mau te wehi everyone! It is great to see the efforts put in to this project, big and small, resulting in such an awesome outcome!